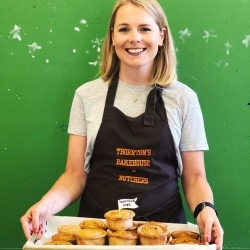 Now then!We're Thornton's Bakehouse & Butchers, a Bakery and Butchers located in Husthwaite, the heart of rural North Yorkshire. We're a third-generation family run business, owned by John Thornton, the son of Geoff from Thornton's Butchers of Easingwold. 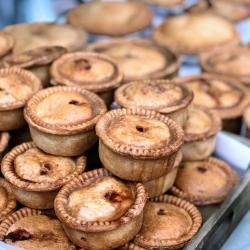 We specialise in handcrafted Pork Pies, Pastries and quality, local Meats. 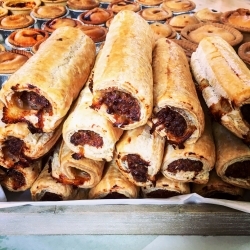 Our Bakery Our Pies and Pastries are made by hand and baked daily in our Bakery at Husthwaite. 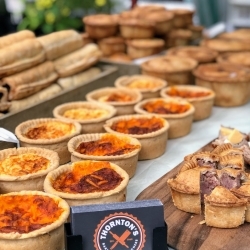 We take great pride in producing delicious, hearty, traditional products which taste as good as they look and uphold the exceptional Thornton’s reputation, developed over decades of serving our customers. 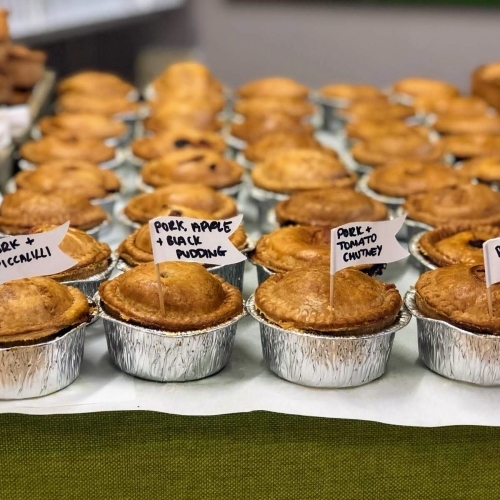 We offer a wide range of Pies in various sizes and many delicious flavours; from the classic Pork Pie to Pork Pies flavoured with Chilli, topped with mouth-watering chutney or dressed with chunks of Black Pudding. Along with our famous Pork Pies we have created a range of other savoury pies; Diced Steak, Chicken & Leek, Lamb & Minted Vegetables and Mince & Onion. We also offer a variety of Pasties, Sausage Rolls, Quiches and rustic Scotch Eggs. 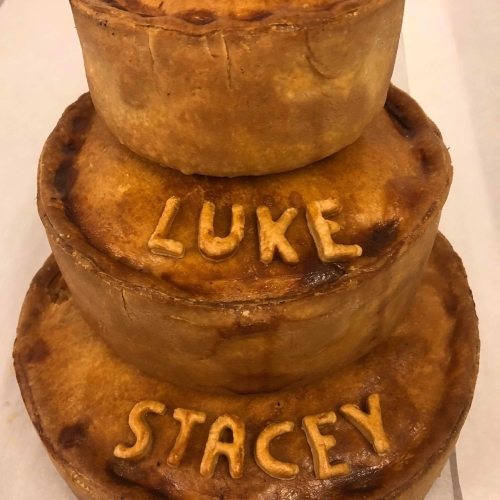 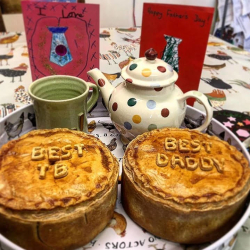 Since inheriting the business in 2017, John has curated our ever-popular Bespoke Pork Pies which can be personalised with wording of your choice. They are available in 3lb, 5lb and 6lb sizes and are ideal for a unique present, celebration or shindig! 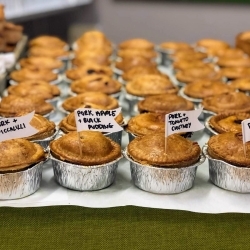 Our Pies & Pastries are stocked in many local Stores, Eateries and Farm Shops. They are available to both wholesale and private customers, please contact us for more information. 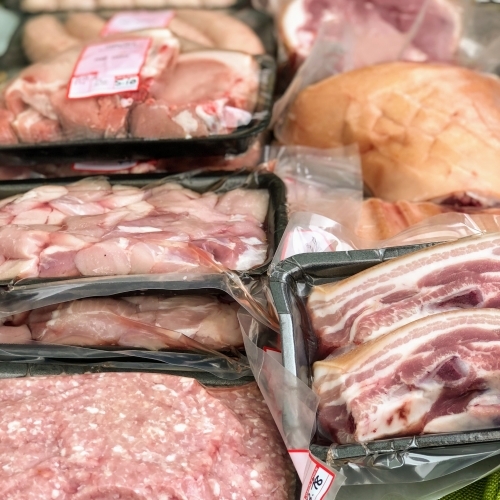 Our Butchers Provenance is at the heart of our Butchery today and has been since we began in 1960 at our old Butcher’s Shop in Easingwold marketplace. 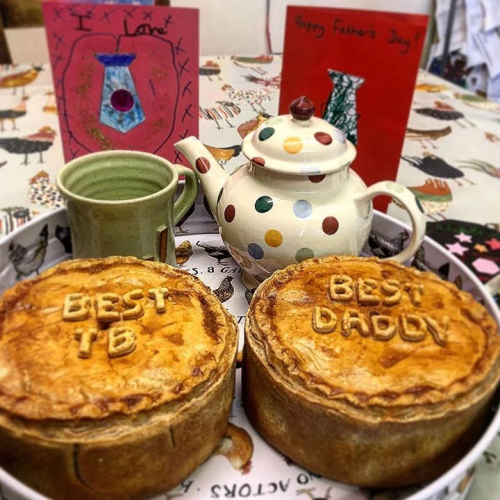 Over the decades of having a Butchery we have developed strong relationships with local farmers and suppliers, and we continue to be passionate about providing meat which has been born and bred in North Yorkshire. Our Lamb is home reared by Geoff on our family farm in Oldstead; Pork comes from Wilson's of Sproxton; Beef is Aberdeen Angus from C. Rooke's of Newton-on-Ouse or Beadlam Grange; Chicken and eggs are from the Yorkshire Wolds. 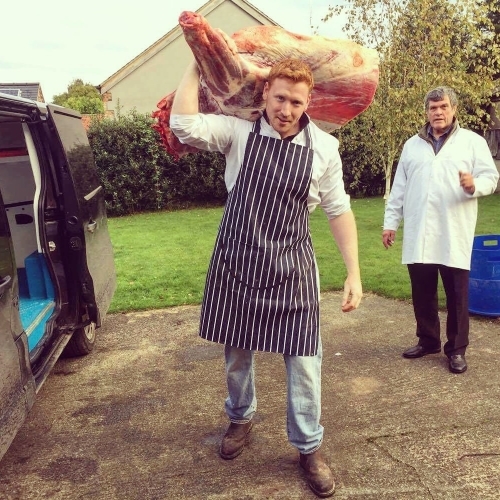 Butchery has been in our family for generations and we care about our customers as much as we care about the welfare of the meat we sell. 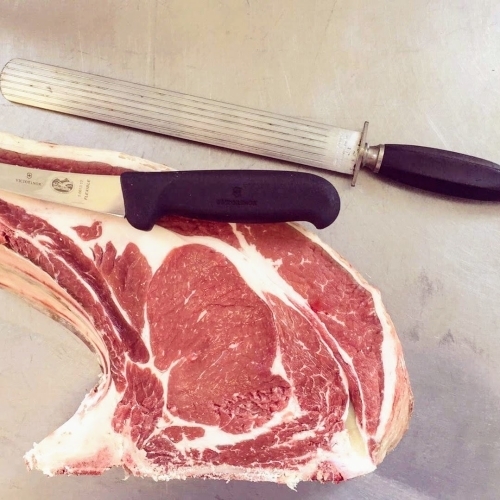 If you're looking for a particular cut or aren't sure what to use for a specific dish then please ask, we can use our knowledge of our trade to help make sure you get exactly what you're looking for. 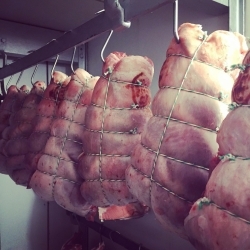 Our meat is used in many local Pubs, Cafes and Restaurants. 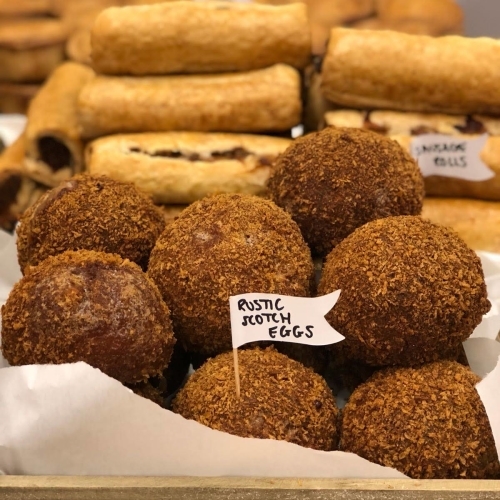 It's available to both wholesale and private customers, please contact us for more information Where to find us We are based in Husthwaite and offer a daily delivery service to Easingwold and the local area from the Bakery and Butchery. This service is available to wholesale and private customers alike. 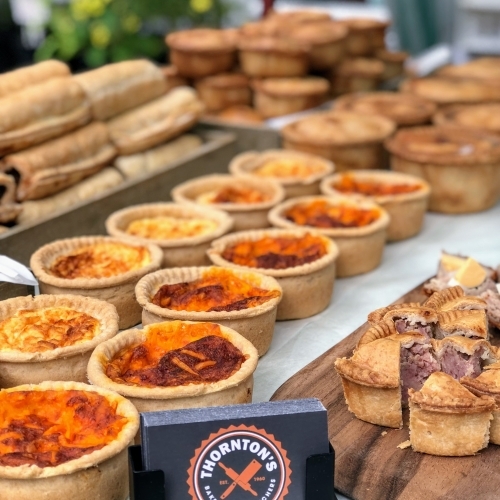 We are a permanent feature at Coxwold Village market which is held on the last Saturday of every month, the Sheriff Hutton Village Market on the third Sunday of every month and at the Husthwaite Village market which is held quarterly.